Is it time to incorporate something new? Outdoor living spaces are becoming a preferred choice for more and more homes in Melbourne. This is because of its growing popularity while benefiting homeowners by adding value to their property and improving its aesthetics. While decking up your property seems to be trending, some homeowners may find it difficult to do the same with a small backyard. Smart planning can help you beautify your property in no time. Here is a guide to help you with the same. Before making any purchases or any decisions, first decide on a budget. It is important to know how much you are willing to spend in order to see the project all the way through. Also remember that costs can exceed the quoted amounts by technicians to be fully prepared financially. In order to ensure you are not over spending limit your budget to 10% of your home’s value and ensure you do not exceed it. In order to ensure you are building a structure that abides with the rules and regulations of your neighbourhood, get permission if required from your local authorities. Take a look at your local laws, check with your utility providers and check HOA and other regulations to ensure you aren’t missing out on anything. It is also important to ensure there are no gas pipes or power lines under your backyard as digging there unknowingly could damage the same. Adding plants and incorporating a garden into your outdoor structure will look amazing, but will you be able to maintain the same? Plants that aren’t maintained will only make your backyard look unkempt and ugly. So, if you do not enjoy getting your green thumb dirty every now and then, consider low maintenance plants or artificial plants. Ask your contractor about self-watering and irrigation options if you still want real plants with low maintenance. Ensure you are clarifying your requirements and ideas with your landscaper for results that match up to our expectations. Did you know a verandah can cool your home by providing shelter from the sun when placed strategically? This means that your power bills will not be slashing your pocket every summer. A verandah also adds to the aesthetics of your home and can be used for creating an outdoor lounging area or even just a reading area that accommodates your favourite books. Rocks have a way of making a property look extravagant and redefining your outdoor experience. These rocks can be used to play or add to your garden or be a beautiful resting place near your little constructed lake. Speak to your landscaper to arrange for the same. You can also add some seating arrangements to your property to make it truly interactive and enjoyable. Add some shade to your seating arrangement for a truly relaxing experience. Owning a breath-taking garden is not difficult if you can get creative. You don’t always have to invest in planters; you can choose to create planters out of an old bucket, a wheelbarrow, a watering can and an unused bird bath. Have vines and hanging flowers decorate these in a flowing manner to create a garden just out of the magazine. Introduce your love for the nightclub into your property. Set up your personal bar to host your favourite themed parties. You can also build a little platform to be used as a stage for occasions and playful fun. Increase the décor with elegant lighting and you may not even need to book a place for the next engagement party in your family. Do you miss your camping experiences of bonding around a bonfire? You can now create those experiences without having to leave your home in Melbourne. Do this by having a fire pit built. This can be extremely useful especially during cold winters when most outdoor entertainment is suspended. An outdoor kitchen can be extremely useful during those many family occasions or parties with friends where cooking doesn’t mean you need to stay away from your guests. Also as the kitchen is the most frequented place during a party your guests will feel more convenience with such a kitchen while grabbing some more snacks. Your kitchen does not need to be too extravagant and can consist of just a pizza oven, barbeque grill or an open grill. This also means that exhaust of the cooking will not be trapped inside your house. Does a drive in cinema seem thrilling to you? Imagine the cinematic experience amidst the outdoors coolness and fresh air. This can make the most dull movie experiences interesting and exciting. Investing in a projector can help cut out on cinema expenses that often don’t even seem worth it. This is an economical idea as you can create the screen from any flat white surface. Don’t refrain from adding a fence to your property. It can create a cosier look that helps small spaces look well organised instead of showing lack of space. You can also add lighting to your fence to truly light up the place; you can complement this with metal art that can be purchased online. It is important to have a space that is sheltered from the extreme weathers especially in Melbourne. A cabana can help provide the same. This also helps make you space cooler if you intend to host parties and guests. 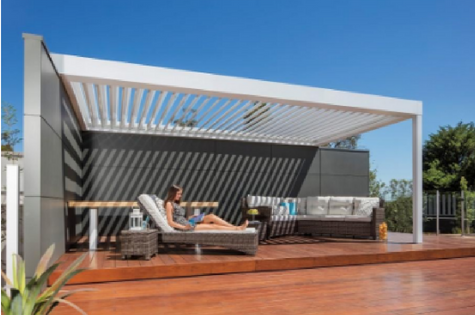 Have a cabana that extends from the house in order to create continuous shelter. To really experience of the indoors amidst the outdoors add a conservatory or sun porch. You can even build the same to have walls connected to your home. While a conservatory has a glass roof a sun porch has an opaque roof. So, you can make a choice between the same. One of the key benefits of such a structure is that you can have it air conditioned. You can use these ideas to rule transform your backyard and make it one that is full of excitement. This increases the utility of the same. Hire a professional help you create the same for a sophisticated construction and to ensure that your investment doesn’t go to waste. Make your backyard alive with these simple ideas!